I drove through the adorable little town of Berkeley Springs, WV to get to Mock’s Greenhouse and Farm. After maneuvering myself through the twisty-turney roads, I finally found the aptly named Tanglewood Road. Then it was up a steep hill that my car almost didn’t manage, and Paul Mock’s farm came into view. Well, not farm in the traditional sense- rows of greenhouses with a gorgeous family home in the forefront. Paul’s wife bought the house in 1998 “for the view”- and a phenomenal view it is. 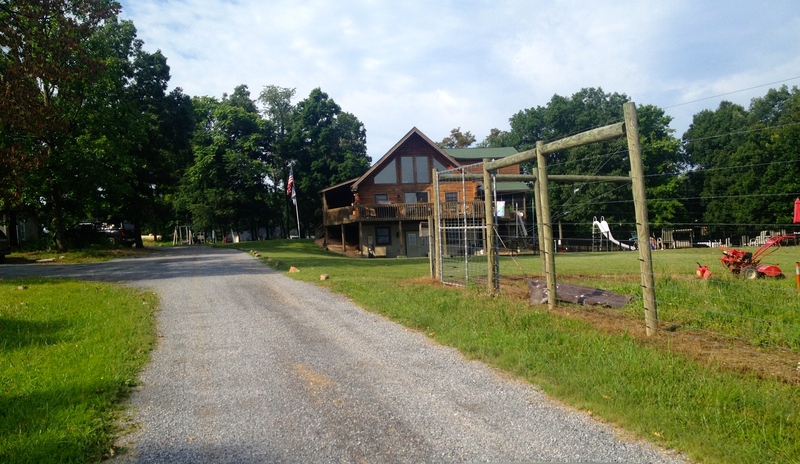 So many beautiful mountains surround the 80 acres, it’s no wonder he moved here! Having lived on a 16 acre farm in Pennsylvania, Paul grew up in a town where farm markets weren’t too popular. They harvested soil-grown vegetables, but the majority of their business came from farm entertainment – pumpkin patches, Haunted Houses, hay rides, etc. When Paul moved to this farm, he attended a number of workshops at universities to learn about new farming techniques, harvest trends and produce development. That was when he decided to take his farm to the next level and build greenhouses for hydroponic produce. 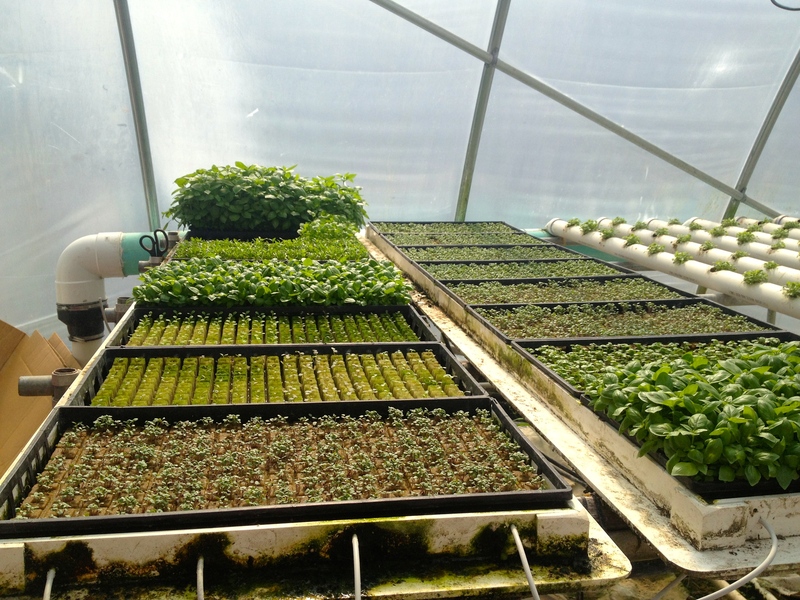 Hydroponic plants are given the same minerals and nutrients found in soil, through water. 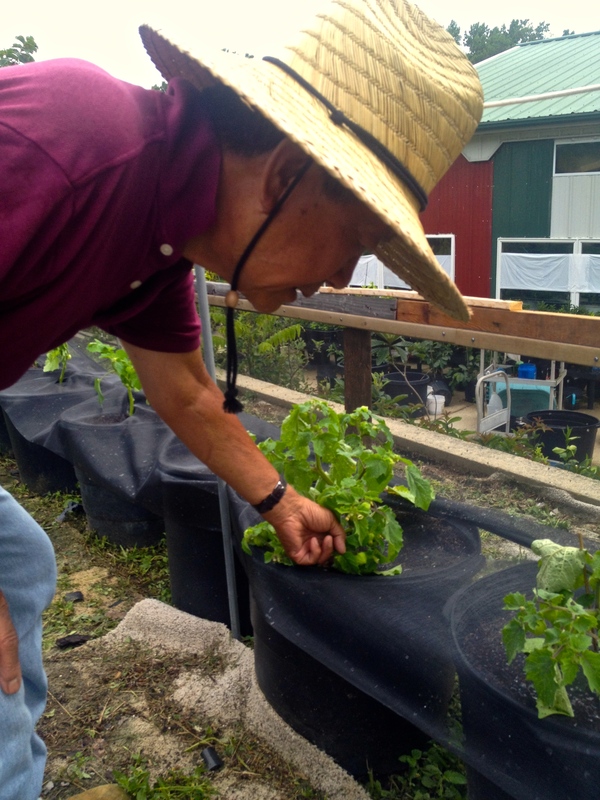 Using water gives Paul the ability to regulate his plant growth and provide optimum plant health and taste. He boasts that 97% of his plants are top quality at every harvest. 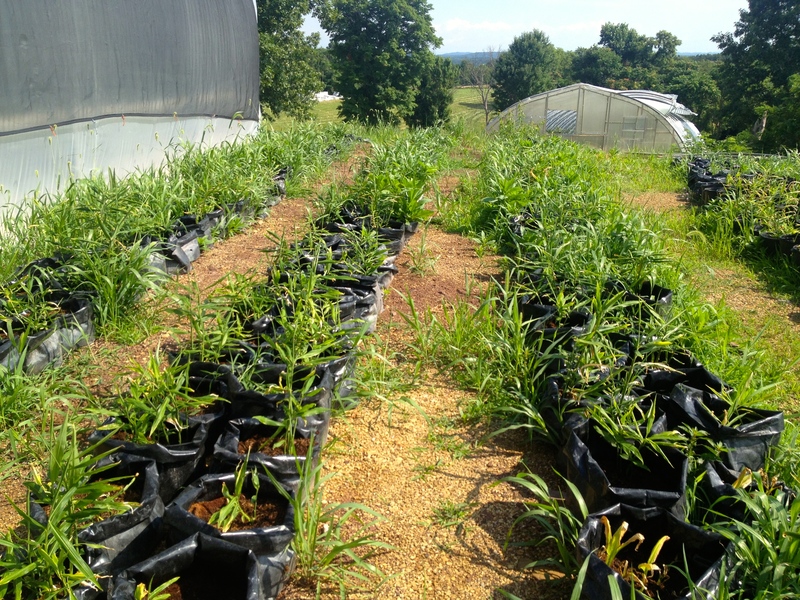 Though he starts with organic seeds and uses no sprays on the surface of the plants, he does use small amounts of regular, commercial fertilizer in the water – so he cannot call himself organic. This doesn’t seem to hurt business though; 80% of his produce goes to wholesale vendors and ends up in places like Whole Foods and Wegmans. The large array of beautiful tomatoes, cucumbers, basil and ginger you see at his market stand accounts for merely 20% of his total harvest. Paul’s market produce goes to 7 different markets. You can imagine what harvest day looks like on Paul’s farm- busy, busy, busy! 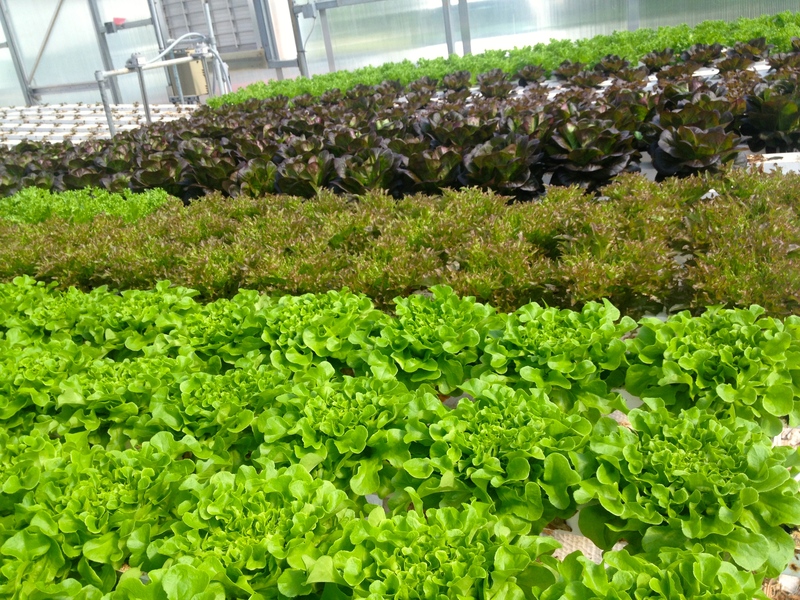 Paul wants his customers to be aware of the benefits of hydroponic produce, and understand that the freshness makes a difference in flavor and taste. 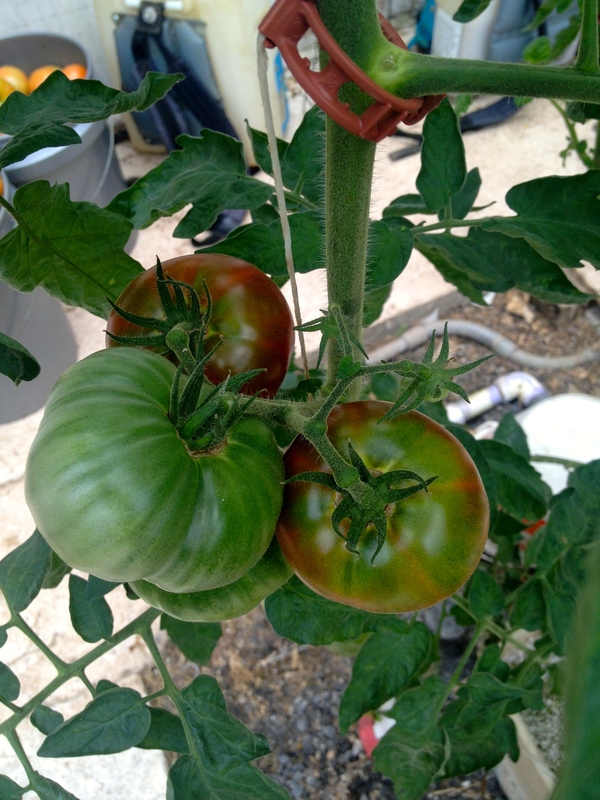 The produce is still close to nature- tomatoes are allowed to ripen on the vine to a certain point, permitting the enzymes to give them proper flavor. Lettuce holds up longer because it was only picked a day or two before market. 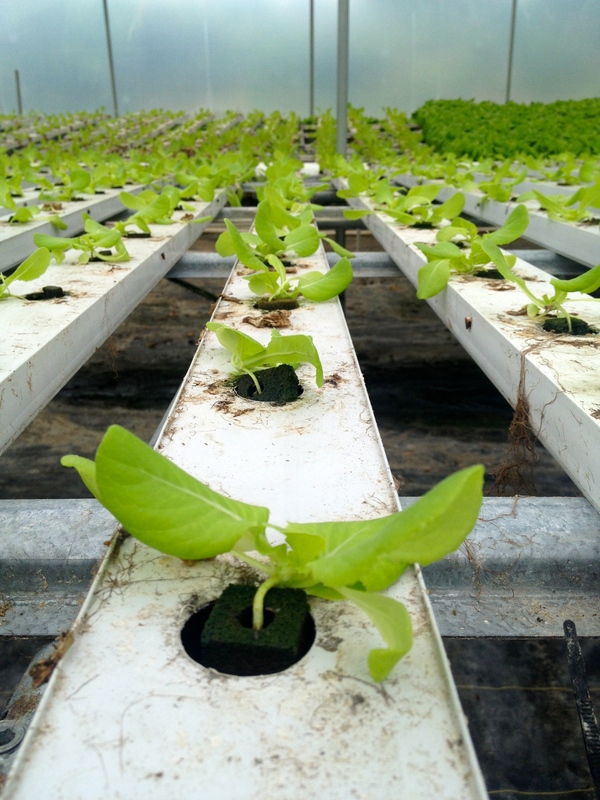 Produce grown hydroponically is very well taken care of, and not subject to the trials of outdoors- and you can tell from it’s appearance! Paul is the only vendor at Central Farm Markets that sells ginger. About two weeks ago, he brought the first crop of baby ginger to the Pike and Bethesda Central Farm Markets. Baby ginger is more tender than it’s mature counterpart, and not as stringy. It has a slightly milder taste and doesn’t need to be shaved before use. Stop by his stand and pick some up! If you find Chef Lynn at any of the markets, she can give you some great ideas for using your ginger. Come see the other amazing things Paul’s farm has to offer, too! He’d love to answer your questions and tell you more about hydroponically grown produce. I thought I knew chocolate. After years of eating, baking with and learning about chocolate, I really believed I had a good grasp on the subject. That was until I met Ismael, the owner of Chocotenango. He has taught me more about the complexities, intricacies and important aspects of chocolate-making than I ever knew. Ismael knows more about the subject than anyone I’ve ever had the pleasure to interview, and while I’d love to tell you all everything I learned, this is a blog and I must refrain from turning it into a novel! So instead, I’ll tell you all about Ismael and his delicious chocolates that can be found every Sunday at the Bethesda Central Farm Market. 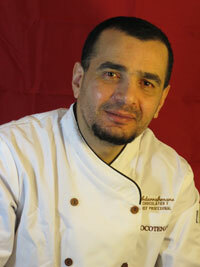 Ismael is originally from Algeria. Since 1994, he has worked as a professional chef doing pastry, savory and chocolate work for prestigious restaurants in London, DC and Boston. In 2002, he and his wife moved to Guatemala where Ismael volunteered for Habitat for Humanity and worked at a few restaurants, while his wife settled into an international health job. 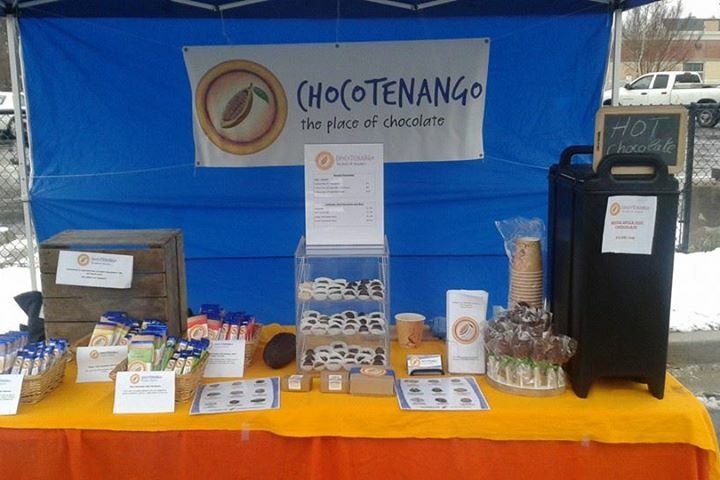 One day, he realized “This town has no chocolate!” He decided to use this as an opportunity to create his own business, and six months later Chocotenango got it’s start. The name has a very simple meaning. 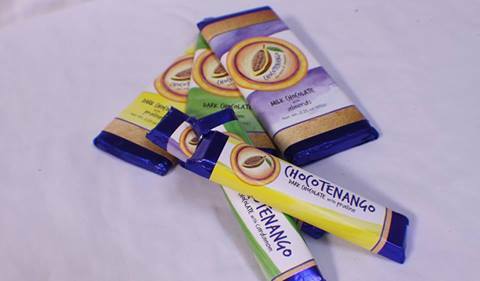 In Guatemala, a lot of the towns end with the word “-tenango” which translates to “place of.” While taste-testing and brainstorming with friends, he came up with the name Chocotenango, which literally means “place of chocolate!” This is quite fitting as the Mayans were the first civilization to discover chocolate and created its many uses we know today. 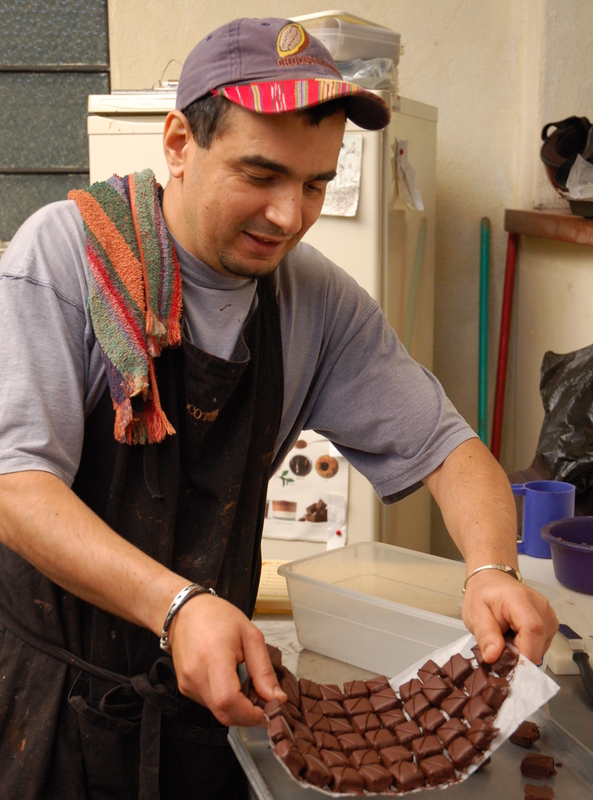 From 2004 to 2008, Ismael taught himself everything he needed to know in order to start and maintain a successful chocolate business. In 2008, Ismael was awarded 1st place at the 13th International Gastronomy Festival of Guatemala for his famous cardamom truffle. Soon after, he sold his company to a friend (who has successfully continued the business since), and took a year and half off to travel the world with his wife. They traveled from Chile to Colombia and from Cape Town to Egypt. Ismael used these travels as inspiration for the next iteration of his business. In 2010, Ismael’s wife got a job and the two of them moved to DC. Ismael spent some time as a chef at The Four Seasons, but when Union Kitchen opened in 2013, he jumped at the chance to continue his passion of chocolate-making. For the first 6 months, he worked both at the restaurant and on his chocolates. He soon realized that if he wanted it done right, he’d have to put his entire self into it. He now spends all of his time painstakingly handling every step of the process himself- from recipe creation to packaging. It takes him 2 whole days to make 800 bars of chocolate. His filled chocolates originally came in 18 different flavors, which he is slowly reducing to 9. Everything is done by hand, much of his time spent working in the walk-in refrigerator so as to keep the product as cold resulting in a very high quality! At the markets, Ismael sells his signature chocolate bars in 4 flavors; two milk and two dark. He also sells boxed chocolates in various delicious flavors (like Chipotle Chili and Seven Spices), hot chocolate mixes, chocolate lollipops and more. Recently, he has added a new product to the mix, something he created using a method called “panning.” It is essentially a way for chocolatiers to evenly cover objects with a delicious layer of chocolate. 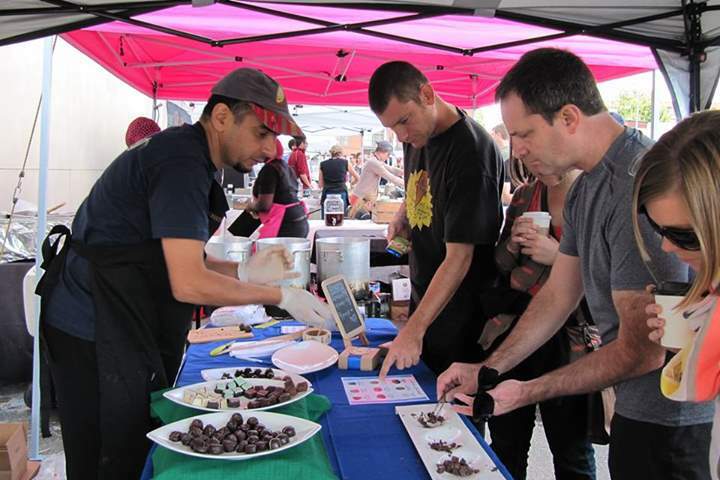 Ismael will have panned goji berries, hickory smoked almonds, salted coffee caramel, espresso beans and dried blueberries at his stand from now on. Ismael sells his products to a few small shops in the area, but farm markets are where he really shines. The sheer knowledge this man has about his product is a drawing point to his stand. I implore you to start a conversation with him- ask him anything you have ever wanted to know about chocolate- from the history to the harvest, I promise he will blow you away with his insight. Stop by his stand for a taste- he always has his chocolate ready for a customer to try it and love it. 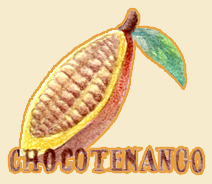 Connect with Chocotenango online – like them on Facebook and follow them on Twitter! Good Gardener. A simple name for a business, sure, but it wasn’t until I visited their farm that I understood the unique origin of the name. Good Gardener started shortly after the owners got married. 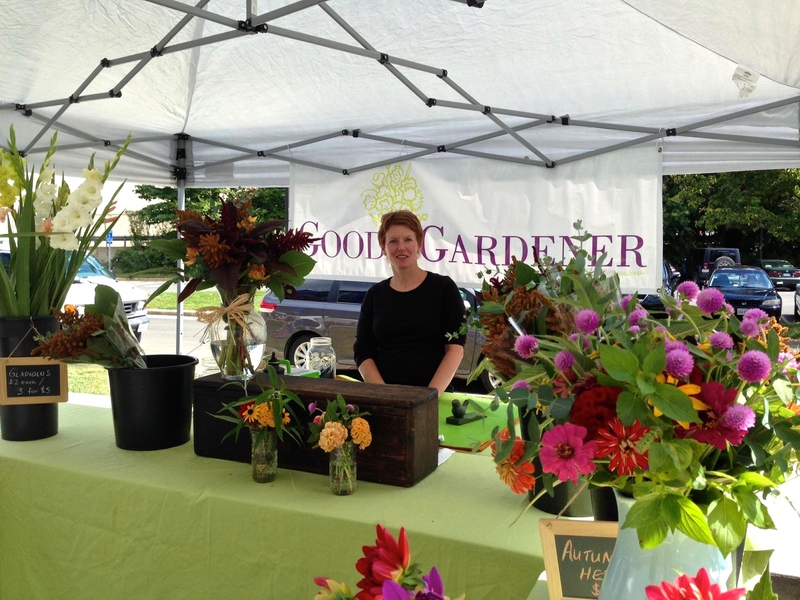 Amy, who you may know from Mosaic Central Farm Market changed her name from Amy Gardner to Amy Gardner DeGood. Amy jokes that once it was in writing, she legally became a good gardener, so it had to be her destiny to grow. It doesn’t hurt that she happens to be a fabulous gardener. How’s that for coincidence? 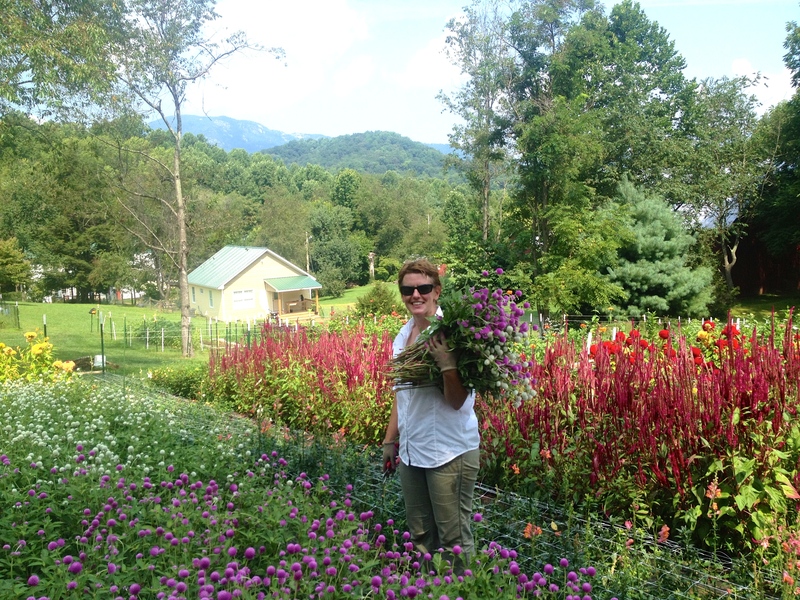 Amy’s farm is located near Old Rag Mountain in gorgeous Etlan, VA where she grows her flowers to sell at markets, stores and via subscribed deliveries. She also makes arrangements and bouquets for weddings. If you’ve never seen a “flower farm,” I highly recommend taking a trip to one. Amy’s fields are a wonderful amalgamation of colors, shapes, and sizes. It’s quite a sight to see! Amy wasn’t always a farmer/florist. Prior to farming, Amy studied photography and lived in New York working in the fashion photography business with artists she had admired since childhood. In 2009, she moved to Virginia to open an art gallery with a friend and freelanced in marketing and events and planned IT summits for a DC-based non-profit. When her parents bought a century-old farmhouse in Etlan in 2011, she moved into a cottage on the property part-time and began to develop a love for turning the soil. One day in 2012, Amy found an article about a beginning farmer program that was accepting applications. After applying to the program, she started thinking about business plans, trying to decide whether to grow veggies or flowers. She chose flowers because she had creative skills that needed an outlet. Flower arrangements would allow her to both grow and tend to the land, while using her creativity. 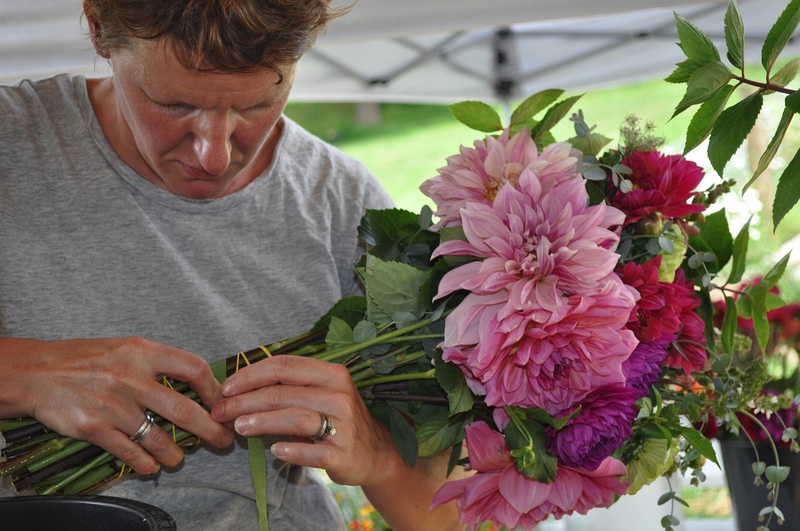 Amy got married on the farm in 2012 and started her flower business shortly after. 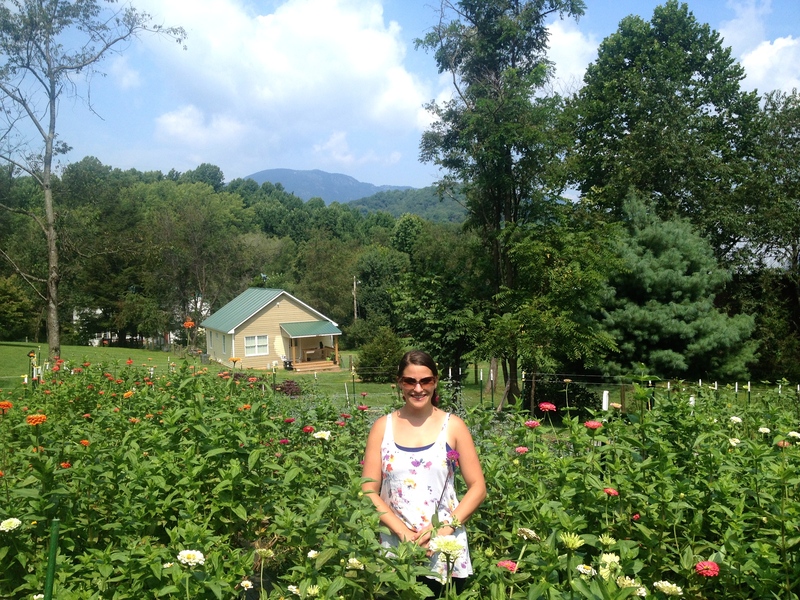 Amy’s farm is full of zinnias, dahlias, celosia, gomphrena, sunflowers, eucalyptus, lizianthus, and more. 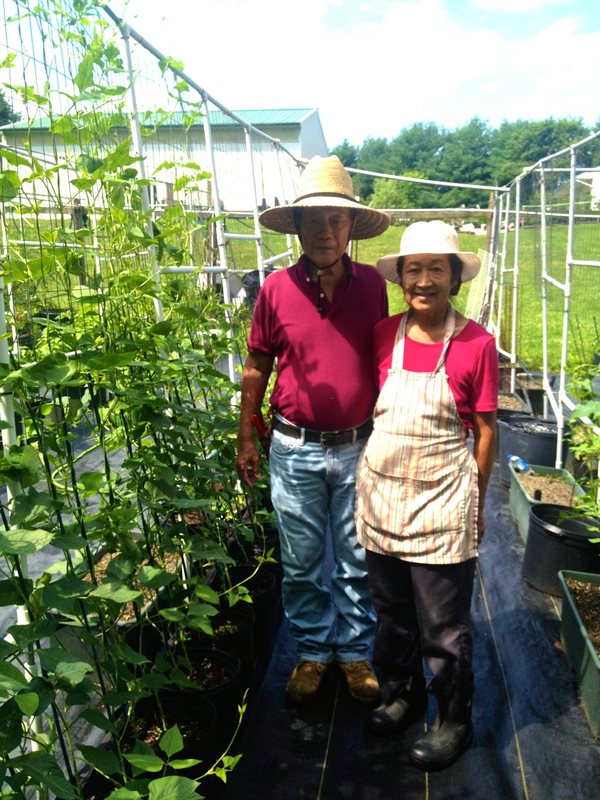 Since this is only the second year of her business, her garden is still in the experimental phase of things. The flowers that I saw were remarkably vivid, healthy and beautiful! 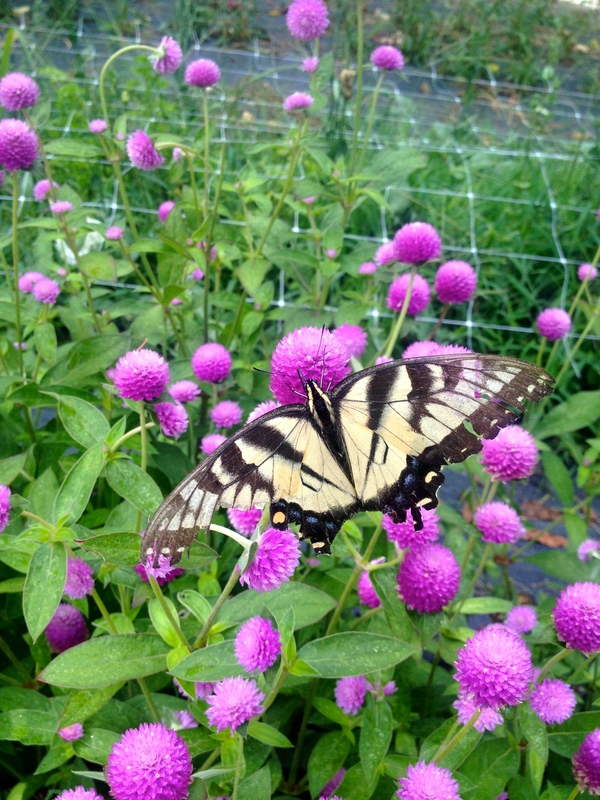 I watched her harvest the flowers with butterflies and bees flying around, doing their pollination dance amongst us. Amy told me about the importance of supporting the farming community by buying local flowers. If you think about it, flowers found in other locations might be coming from all around the world, harvested long before you take them home. This has a serious implication environmentally, as well as quality-wise. 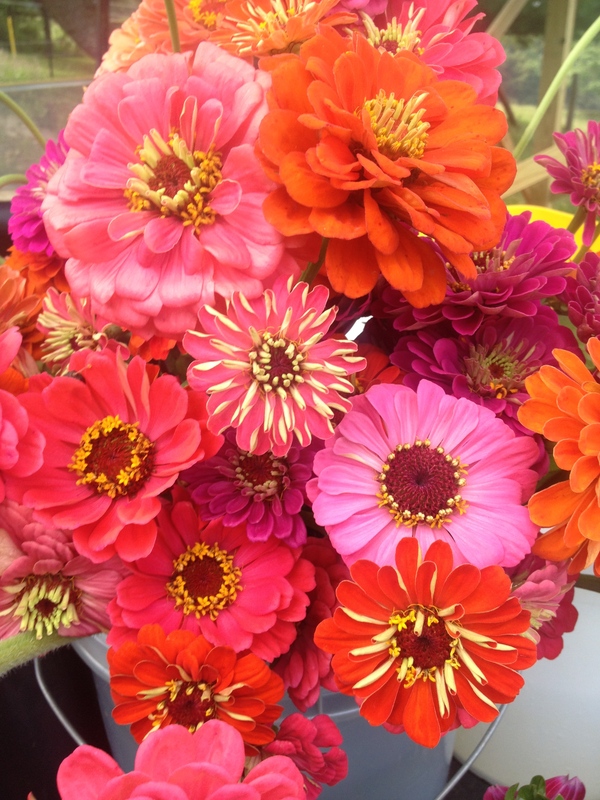 Flowers from Amy’s farm, which are sold at the Mosaic Market on Sundays, are harvested 1-2 days before being purchased! This means not only will they last longer than store bought flowers, but also they are not grown using harsh chemicals, so they are safe to touch and smell. Amy would love to own a storefront some day. 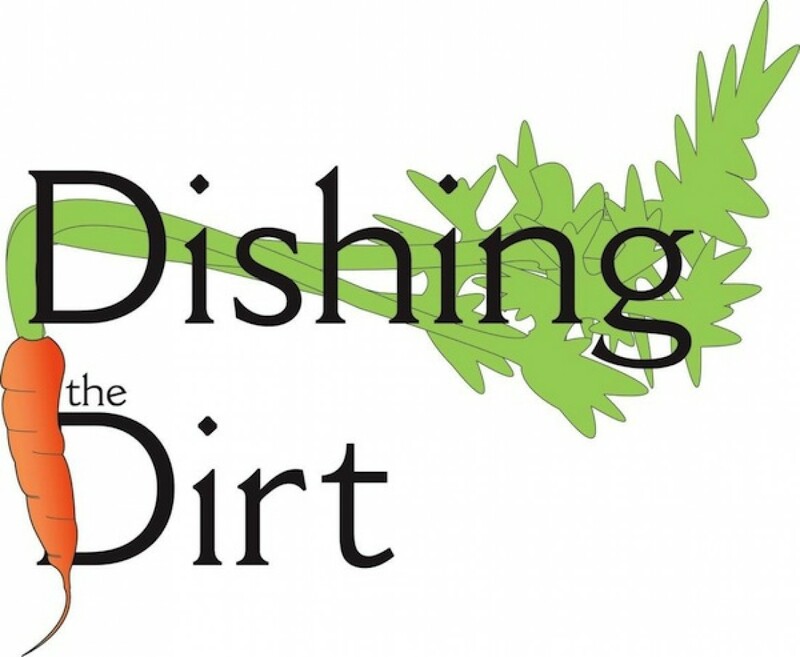 She has a lot of plans for the future growth of her garden and hopes to continue sharing the importance of local, community-supported agriculture. She is also experimenting with drying flowers; making wreaths and arrangements that will last longer than bouquets. I urge you to stop by Amy’s stand at Mosaic this Sunday. Take a long look at some flowers you may never have noticed before. Appreciate the care and attention that goes into growing and arranging all of the beautiful bouquets Amy brings for sale, that she carefully wraps up for you to take home. 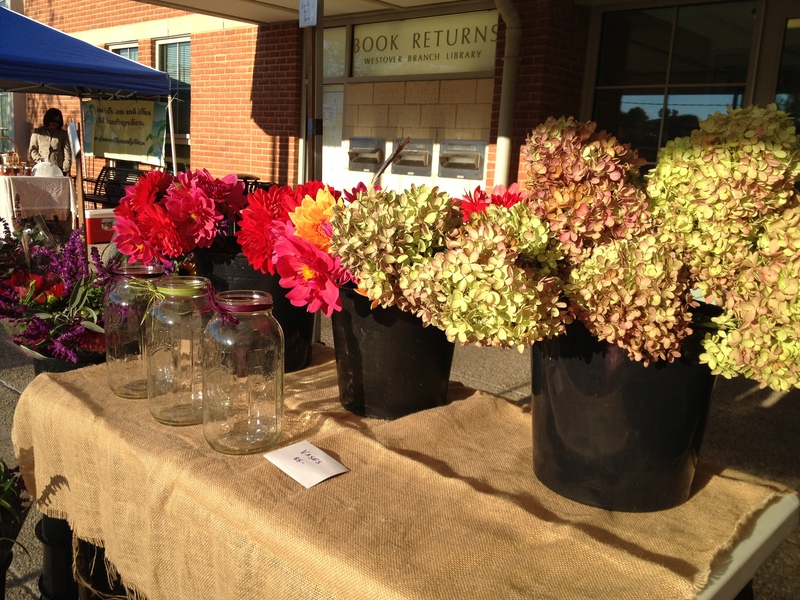 Support local farmers by purchasing produce AND beautiful flowers! In my opinion, you never need an occasion to have flowers brighten up your day – treat yourself, you deserve it! When you walk up to the Pong’s Orchard table at Bethesda Central Farm Market, you’ll meet Samantha. She is the market representative for her grandparent’s orchard, Pong’s Orchard in Howard County. Samantha is adorable – she always has a joke, a story or a cute picture to show me. Besides being a friendly vendor, Samantha is also extremely knowledgeable about her family’s business and the products they grow and sell. Around her stand you will see citrus plants on the ground and orchard fruit laid out on the table. 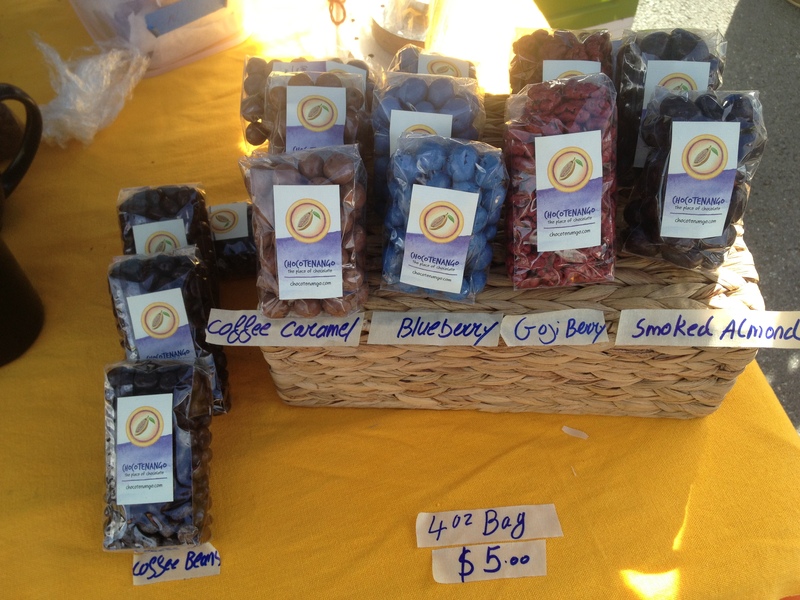 During the summer months, Pong’s provides market patrons with nectarines, peaches, tomatoes, blueberries and plums. And now their real specialty is in season, Asian Pears – they have many varieties of this sweet, crispy fruit. Aside from the Asian Pears, Al and May put a lot of time and effort into growing plants and fruits that have health benefits. 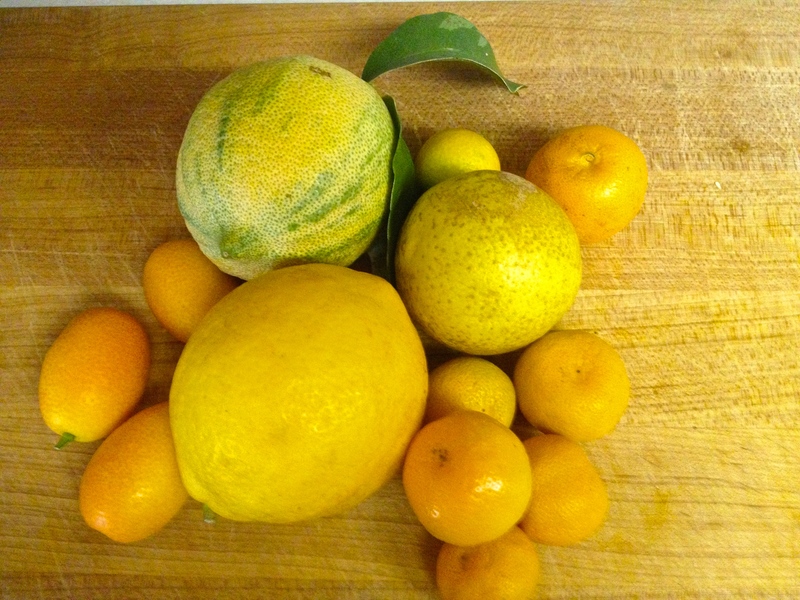 Al is interested in learning about heart health and other medicinal values of citrus fruits. When I met him, he walked up to me with a folder and enthusiastically gave me a stack of articles, studies, and descriptions of these health benefits that he printed out just for me. Al loves to share his knowledge with his customers and made me promise to share this information with my readers. His contact information is located at the bottom of this post- I know he’d love to answer any questions that you might have for him. One big thing I learned from my visit to Pong’s Orchard was the sheer number of citrus plants there are in the world. The Pong’s raise at least 20-25 different varieties – and they’ll tell you about the medicinal value, taste, texture, origin, and the best use for each individual fruit. I saw and learned about Kisxu, Persian Limes, Sumo Tangerines, Satsuma, Meixua, Fig and even Papaya – all citrus plants from around the world, grown right here in our area, and sold by Samantha at the market. I highly encourage you to stop by the Pong’s Orchard table on Sundays and learn about the rare plants Samantha is selling. 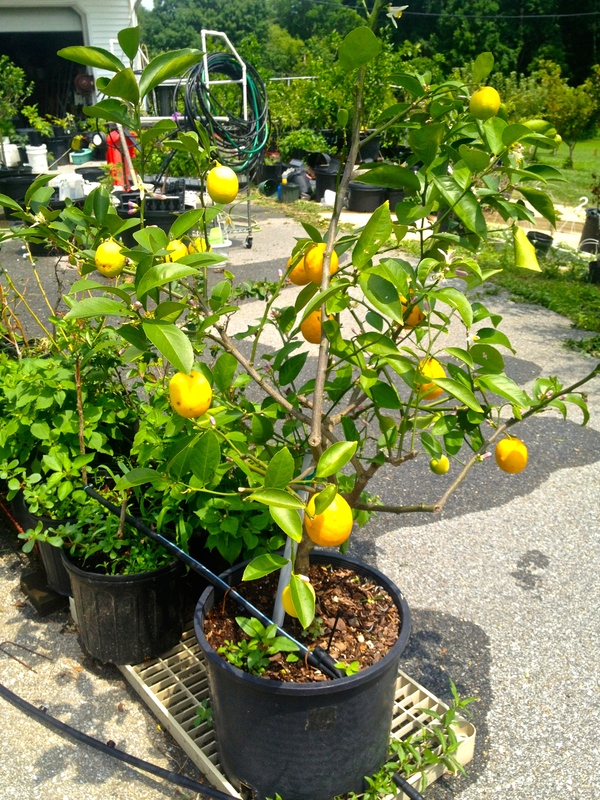 She’s been selling at the Bethesda market for four years now, and she particularly loves when children become interested in the plants – she considers it a great way to show kids where fruit comes from and how to take care of a plant, as citrus plants are very low maintenance. All of the Pong’s trees are available for sale at the market, but you’ll have to order them before hand, as there is just no way for her to bring every variety every week! So come by, get some fruit and chat with Samantha, who will tell you the best citrus to use in a cocktail, a salad or to enjoy as a snack. Pong’s Orchard is a rare gem and we encourage you to enjoy what they offer! To contact Al Pong for special orders (to have them bring a particular plant to the market for you), or for questions regarding the health properties of his plants, email him at AsianPearMD@Verizon.net.